New Corrosion Resistant Chain Hoists! ← What is Polypropylene Rope? We’ve recently added a brand-new range of corrosion-resistant chain hoists to our site that we’re sure will appeal to those of you who are looking for a lifting solution that is suitable for use in harsh environments! Unlike your standard chain hoists, these corrosion resistant chain hoists have a protective coating that means they can be used in conditions where other materials would corrode quickly! These corrosion resistant chain blocks feature a stainless-steel hand and load chain making them incredibly durable. 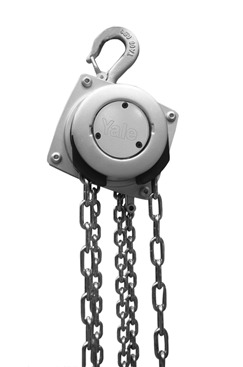 This particular type of chain block is ideal for use in confined areas because it features a unique 360° rotating hand chain guide, making all of your lifting jobs incredibly easy regardless of the conditions you’re working in! They are available in a range of different weight capacities and chain lengths to suit your needs. Another of our new corrosion-resistant chain hoist products are these Corrosion Resistant Trolley Hoists. 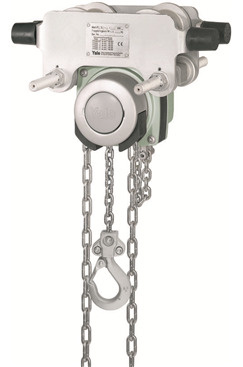 Much like the chain blocks, these trolley hoists come in a variety of different weight capacities from 500kg to 1250kg and they have the same revolutionary 360° hand chain guide. These trolley hoists are available with an integral push trolley or an integrally geared trolley, depending on your preference. These corrosion-resistant chain hoists are perfect for use in the food processing industry, chemical industries such as the paper or dye industries, or for use in farming or sewage treatment plants. All of our corrosion resistant chain hoists are fully tested and certified, so you can purchase them with confidence. If you have any questions about our new corrosion-resistant chain hoist range, or if you have any general queries that we can help you with – don’t hesitate to get in touch! Have you found yourself wondering 'what is a chain block?'. Find out all you need to know today.